HELL bath no fury like the US scorned! Venezuela and Brazil have touched on the raw the Big Brother of the First World, by evoking an anti-US ruling from the one-year old World Trade Organization'(WTO). The organisation came into existence on January 1, 1995, as a successor to GATT (the General Agreement on Tariffs and Trade). Making a judgement for the Very first time since its inception, the WTO ruled on January 17 that the US violated its environmental laws on petrol. Brazil and Venezuela lodged a complaint with the WTO, maintaining that the US was practising unfair trade tactics. While US petrol producers got away scot-free without observing the environmental laws, foreign concerns were forced to stick by them. 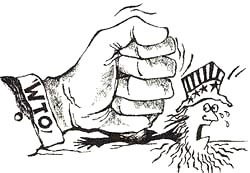 Although facing flak, the US is seriously considering an appeal against the WTO dispute panel judgement, which several critics - supporters of global free-trading - label as a "gross attack on the sovereignty of the US". The WTO panel found out that some of the US Environmental Protection Agency (EPA) regulations were violating global trade rules by setting higher environmental standards for imported gasoline, as against those applicable to domestic gasoline. These EPA rules (Clean Air Act), introduced on January 1, 1995 - uncannily coinciding with the birth of the Geneva-based WTO - required that petrol sold in urban areas should contain "reduced toxic and smog-causing contaminants". Although the rules were meant to affect all the refiners, foreign firms were under pressure from the US to observe them. Meanwhile, US gasoline producers stuck to the 1990 standard quality level. In this context, one may point out that Venezuela is the largest exporter of gasoline to the US, and it is estimated to lose about US $150 million due to the rule discrimination. Speculation was rife following the mandate. The most stringent critics of the ruling were Patrick J Buchanan, a conservative candidate for the Republican presidential elections, and Public Citizen, a public welfare group. Both opposed the US' on membership to the WTO. Economic observers in the US and elsewhere, watching the developments keenly, commented that the ruling might generate intense "protectionist and isolationist sentiment", whereas others stressed that the ruling is "honest", "a welcome decision" and "beneficial" for the US. Observers state that if the godfather of the world's trading bodies does not force the US to change its fuel law, nations like Venezuela and Brazil might "retaliate" with higher tariff rates against US exports. The 'discriminatory provision' expires anyway in 1998. But on the whole, the first judicial panel ruling of the WTO is regarded as a very crucial test case for the organisation and its ability to safeguard and enforce global trade rules. Procedures for the settlement of trade disputes sometimes never reached GATT before. But under current norms, nations cannot block the WTO's rulings or ward off rule implementation. If the US does not appeal, the ruling would be adopted within 60 days (in exceptional cases, 90 days), which is more or less binding.